Hi everyone and I hope your weekend is going great! Today I wanted to take a moment to talk a little about Exotic Barnyard Birds!Exotic Birds are very special birds that can be born at random from ANY bird breeding combination. And the great thing about these special and rare birds is that they will give a gradual boost to the Vivacity of birds within 10 meters over a period of time! 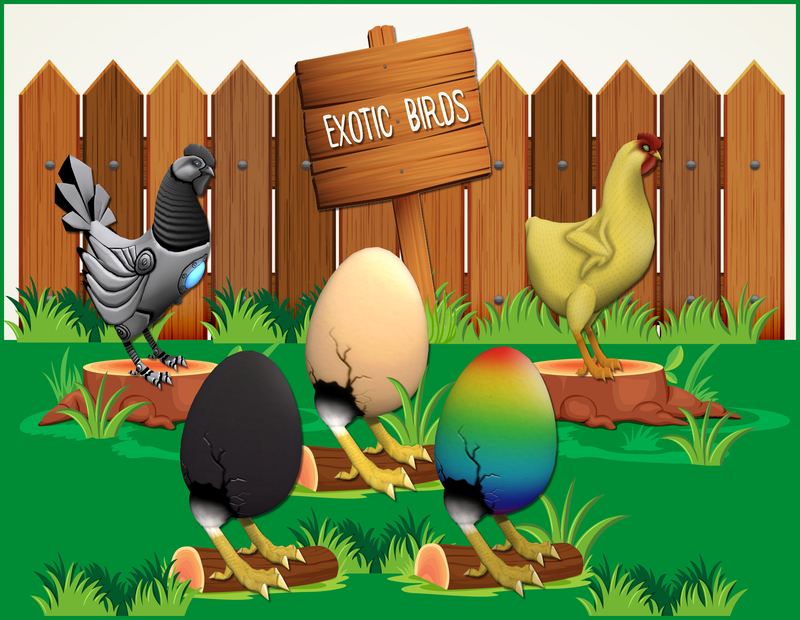 When you breed an Exotic Bird (whether it is with another Exotic Bird or any other bird) you DO have an increased chance at receiving another random Exotic Bird. The Exotic Birds are NOT able to pass their breed or eyes. However, you could get extremely lucky and birth another Exotic Bird. The non-Exotic offspring of Exotic Birds do NOT have an increased chance of producing Exotic Birds. Let’s take a look at this gorgeous birds below!